Sports Authority Field at Mile High, previously known as Invesco Field at Mile High, and commonly known as Mile High or Mile High Stadium, is an American football stadium in Denver, Colorado. The field is named after a sponsor and the stadium is named Mile High. The stadium's primary tenant is the Denver Broncos of the National Football League (NFL). The stadium opened in 2001 to replace Mile High Stadium. The stadium was largely paid for by taxpayers in the Denver metropolitan area and the property is owned by a special taxing district. More controversially, Invesco paid $120 million for the original naming rights, before Sports Authority secured the naming rights on August 16, 2011. Despite its sponsor's liquidation and closure, the Sports Authority name is still being used on the stadium for the time being due to contract reasons. 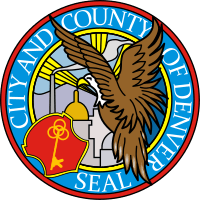 On August 16, 2011, The Metropolitan Stadium District announced Invesco would immediately transfer the naming rights to Englewood, Colorado-based Sports Authority in a 25-year agreement worth $6 million per year. 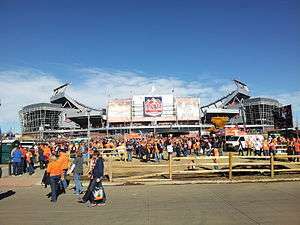 After Sports Authority missed two quarterly payments as a result of its March 2016 bankruptcy and subsequent liquidation, the Broncos organization and the Metropolitan Football Stadium District are seeking to terminate the naming rights contract. 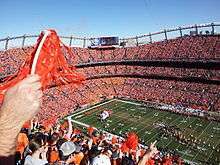 A home game tradition (carried over from the original Mile High Stadium) is the "Incomplete Chant." At Bronco home games, when the opposing team throws an incomplete pass, the stadium announcer will state "Pass thrown by [the opposing quarterback] intended for [the opposing intended receiver] is..." at which time the fans complete the sentence by shouting "IN-COM-PLETE!!" This is followed by the "sad trombone" sound effect. Finally, especially in the upper two decks, the fans create their own 'Mile High Thunder' (and warm themselves) by stamping their feet on the stadium's floors. The old Mile High Stadium was built with bare metal, and the 'Thunder' reverberated readily. The new stadium was built with steel floors to preserve this unique acoustic. In 2013 it was revealed that a Kansas City Chiefs jersey (Neil Smith) was buried somewhere near the 50-yard line by a couple of out-of-state contractors during renovations. Sports Authority Field at Mile High before the start of the 2013 AFC Championship game. On November 26, 2009, it hosted its first Thanksgiving game, when the Broncos took on the Giants. The game was televised on the NFL Network, which the Broncos won by a final score of 26–6. The field at Sports Authority Field at Mile High. The main entrance of the stadium, when it was known as Invesco Field at Mile High. The south end zone as it looked during the final day of the 2008 Democratic National Convention. The stadium has hosted other sports events. The first football game held was the Rocky Mountain Showdown, when the University of Colorado Buffaloes defeated the Colorado State University Rams, 41–14. On July 2, 2005, it hosted the 2005 Major League Lacrosse All-Star Game. In 2006, Major League Lacrosse placed the expansion Outlaws in Denver. The stadium has held several concerts. The first event held was a concert by the Eagles. Irish rock band U2 performed at the stadium on May 21, 2011, during their U2 360° Tour in front of a sold out crowd of 77,918 people. The show was originally to be held on June 12, 2010, but was postponed, due to Bono's emergency back surgery. In August 2004, it hosted the Drum Corps International Division I World Championships. 1 2 "Inside the Construction of Invesco Field at Mile High". SportsBusiness Journal. September 3, 2001. Retrieved September 14, 2011. ↑ Murphy, Chuck (2012-01-27). "Tax off books, but not registers". Denver Post. Retrieved 31 January 2014. 1 2 Caldwell, Gray (August 16, 2011). "A New Home". Denver Broncos. Retrieved September 21, 2016. ↑ Favre, Gregory E. (August 10, 2006). "A Mile High Controversy". Retrieved September 25, 2006. ↑ Wallace, Alicia (May 31, 2016). "Broncos want to nix sponsorship agreement after Sports Authority misses payments". The Denver Post. Retrieved 1 June 2016. ↑ Bunch, Joey (April 26, 2016). "Bill would forever preserve "Mile High" in Broncos' stadium name". The Denver Post. Retrieved May 5, 2016. ↑ Bunch, Joey (May 5, 2016). "Senate Republicans kill bill to retain "Mile High" in stadium's name". The Denver Post. Retrieved May 5, 2016. ↑ "The New And Improved Mile High". Stadium Journey. ↑ Klis, Mike (December 21, 2012). "Broncos, Stadium District to spend $30 million on Mile High improvements". The Denver Post. Retrieved December 21, 2012. ↑ "Troy claims a secret lies beneath the 50 yard line... | The Rick Lewis Show | 103.5 The Fox". 103.5 The Fox. Retrieved 2016-04-22. ↑ "Drum Corps International Past Champions and Locations". ↑ "Obama Accepts Democrat Nomination". BBC News. BBC. August 29, 2008. Retrieved August 29, 2008. ↑ "Obama Greeted By Screaming Crowd at Stadium". Associated Press. August 28, 2008. Retrieved August 29, 2008. ↑ Lloyd, Robert (August 29, 2008). "Barack Obama, Al Gore Raise the Roof at Invesco Field". Los Angeles Times. Retrieved August 29, 2008. ↑ Wangsness, Lisa (August 29, 2008). "Some Saw Spectacular, Others Just Spectacle". The Boston Globe. Retrieved August 29, 2008. ↑ Ringo, Kyle. "Kickoff: Birth of a Stadium". Rocky Mountain News. Archived from the original on July 22, 2006. Retrieved November 30, 2006. 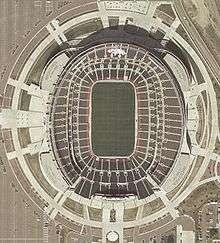 Wikimedia Commons has media related to Sports Authority Field at Mile High.